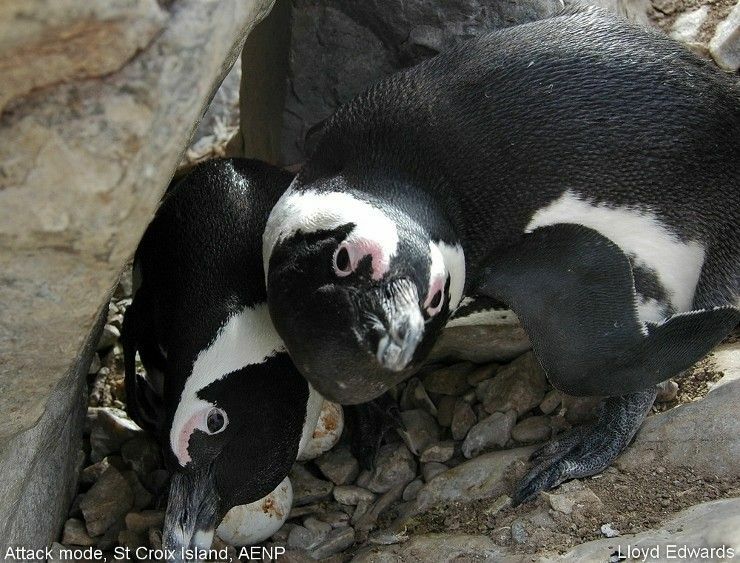 While perfectly designed for a life at sea, penguins must come to shore in order to breed. 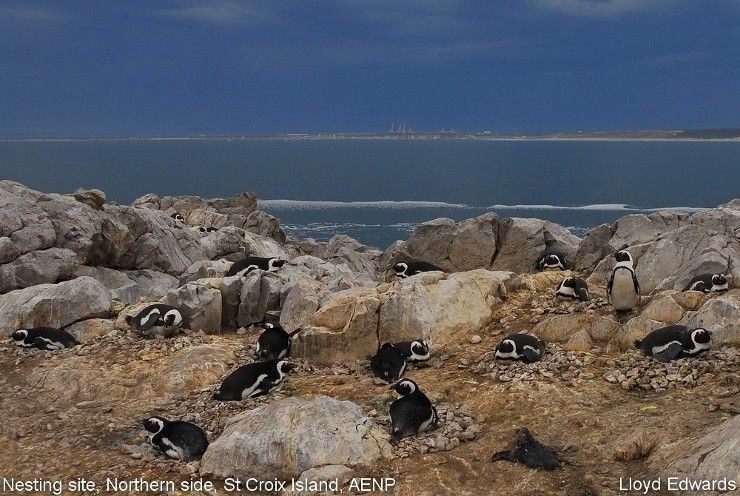 They are notoriously clumsy on the rocky shores of St Croix and Bird Islands in the Addo Elephant National Park (AENP). 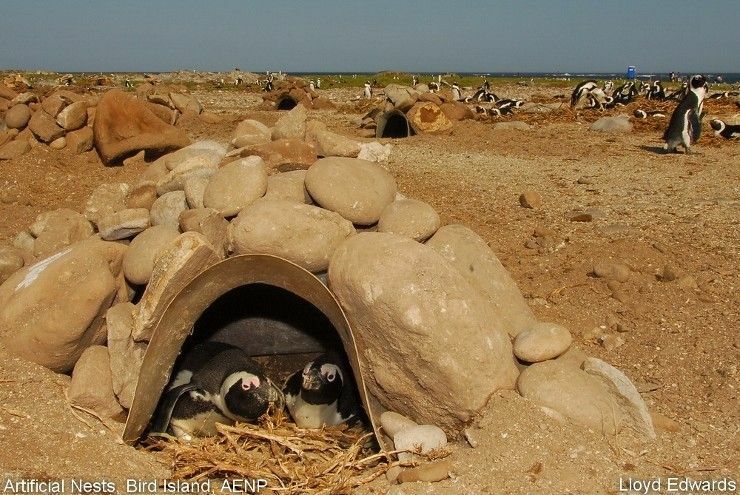 Although historically they nested in burrows excavated in the guano, this was removed by guano collectors. 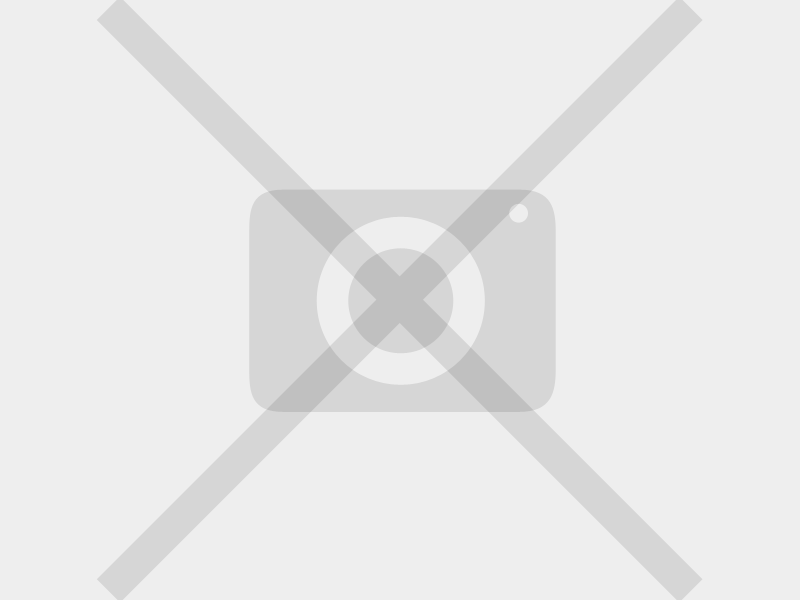 Most now use open nests or nest in holes between the rocks or any other form of shelter. 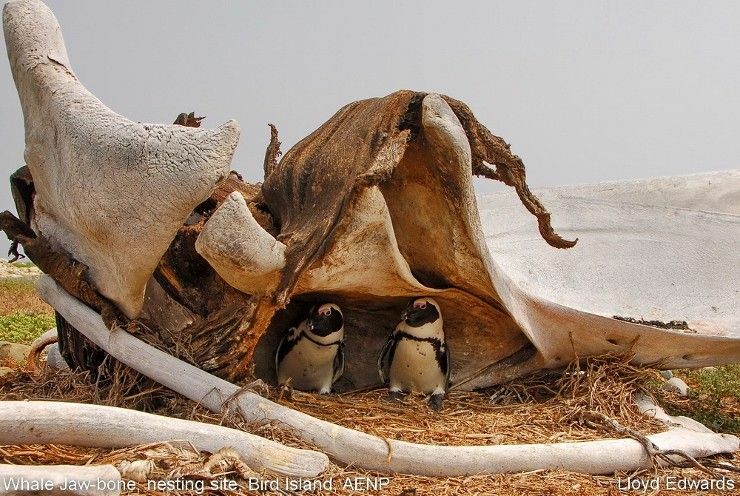 Although their fat layer protects them from cold water, during breeding this can become a serious drawback as land temperatures on the islands approach 40 degrees. 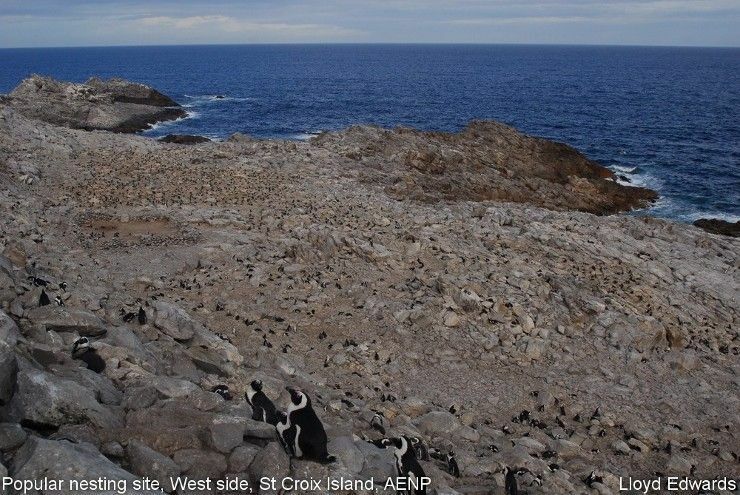 This makes a well-ventilated nesting site extremely important and on St Croix some penguins nest on the summit which is 54 metres above sea level. 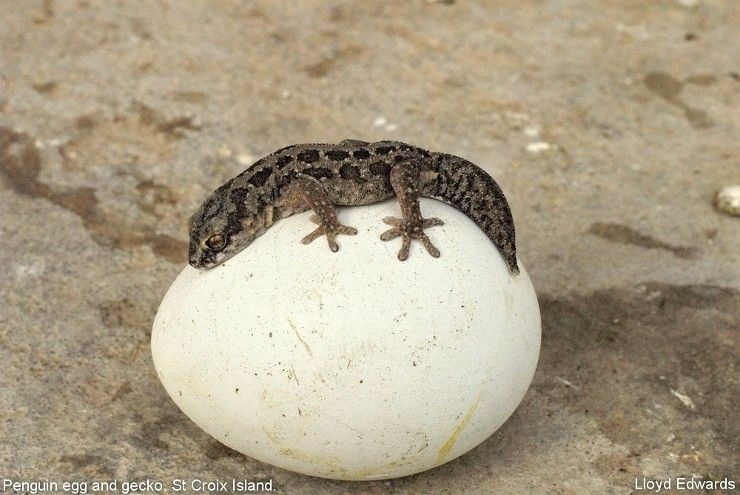 The peak of the breeding season is from March until May, although they can breed during almost any time of the year. It is no coincidence that this is when the vast schools of bait fish swim past Algoa Bay to form the annual “sardine run” off the Kwazulu-Natal coast in June. 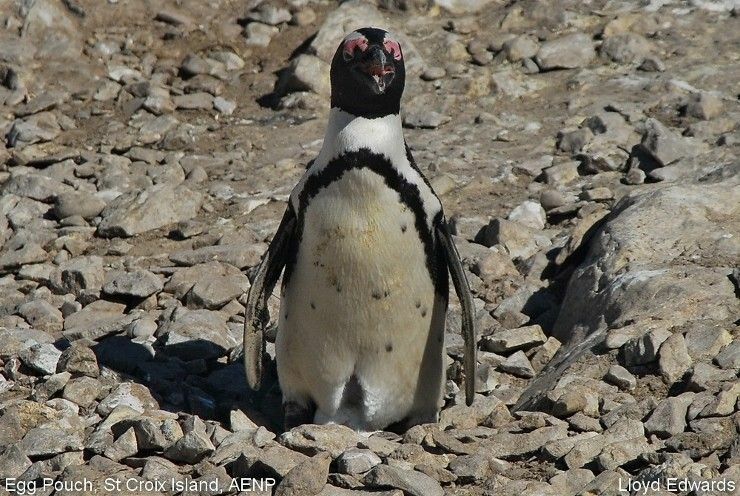 Male penguins are first ashore followed by the females four days later. Usually the same pair will return to the previous year’s nest site. They can split after a failed breeding attempt, but some couples have remained together for up to ten years. 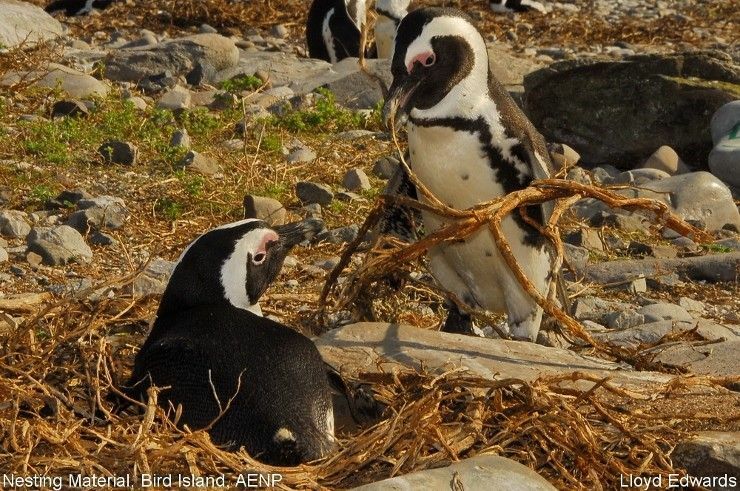 The pair constructs their nest together using various oddments like pebbles, bones, seaweed, wood, fishing line and even dead chicks! 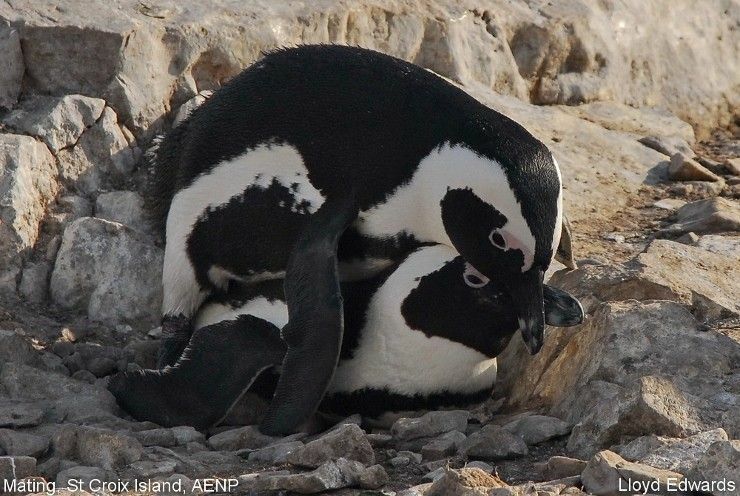 Mating is another clumsy affair with the male balancing on top of the female. 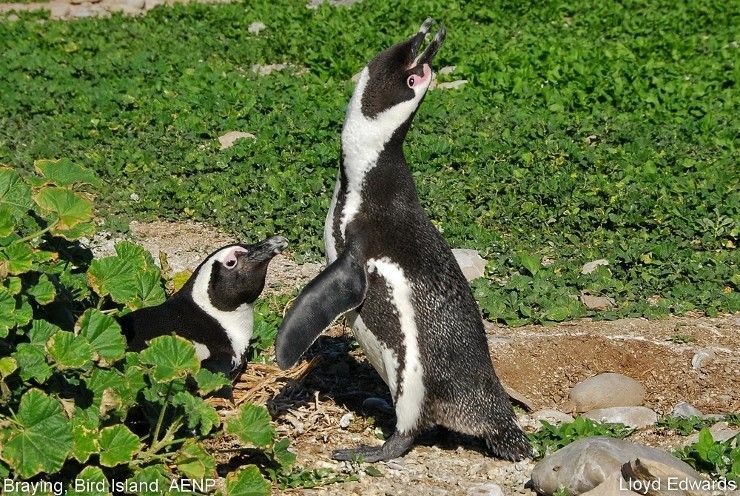 The braying of the males is most intense during the early part of the breeding season, giving rise to its original name, the Jackass Penguin. 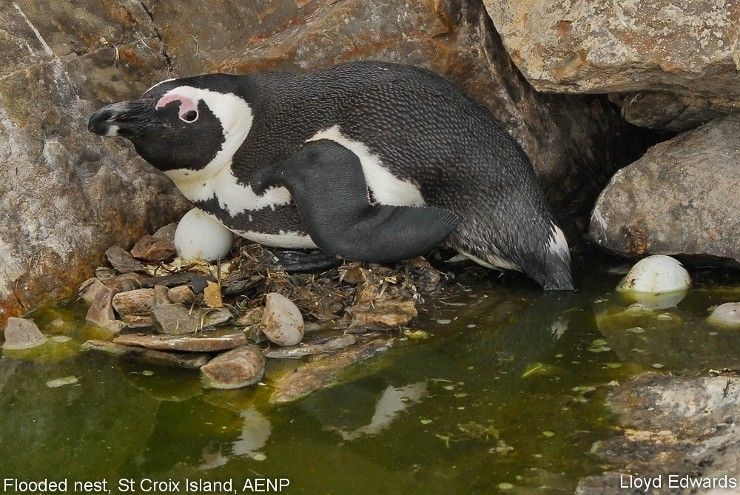 After three weeks on land the female normally lays two eggs, two days apart, although one, three and once even four eggs were observed. Incubation is shared and while one guards the nest, the other will be out feeding for between one and two and a half days. If nests are approached too closely, the adult turns its head from side to side warning of an imminent attack. Lost clutches due to predation, lack of food or weather have been replaced up to four times in one season. 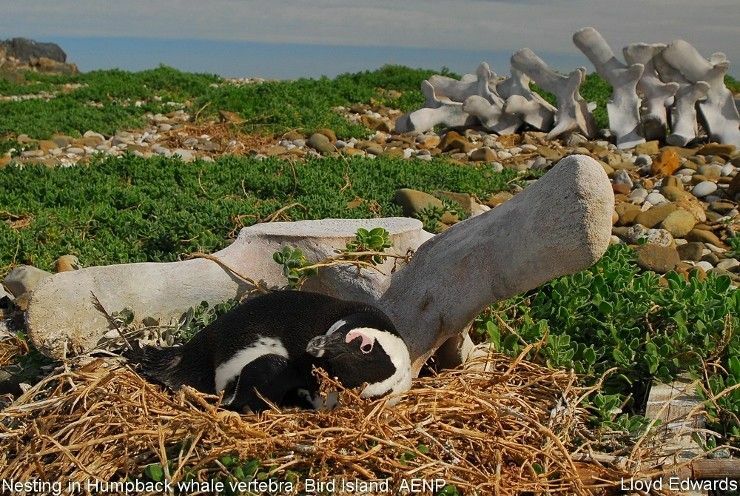 In about 90% of successful breeding attempts, only one of the chicks will fledge (leave the nest) as most parents are simply not able to supply enough food. 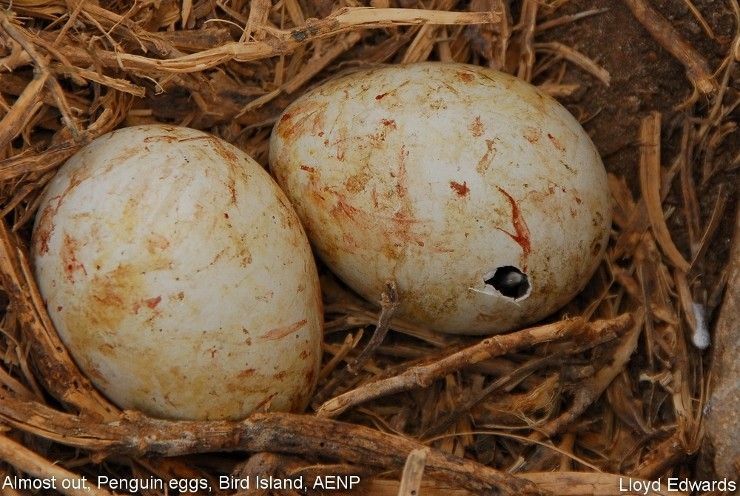 In years of abundant food supply both may make it while in years when food is scarce, mass desertion of nests and chicks has been recorded. 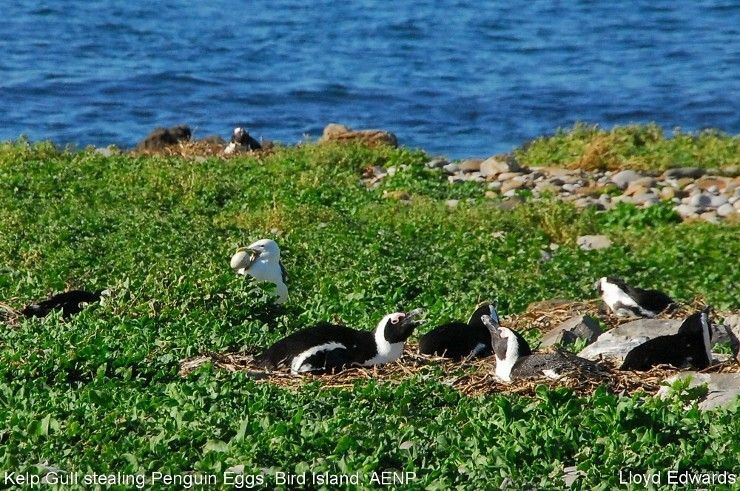 On Bird Island in February 2009, SANParks implanted 150 artificial burrows in order to see if it would reduce the predation of eggs and chicks by Kelp gulls (which had increased in numbers due to food subsidies by humans) as well as their vulnerability to extreme weather events. 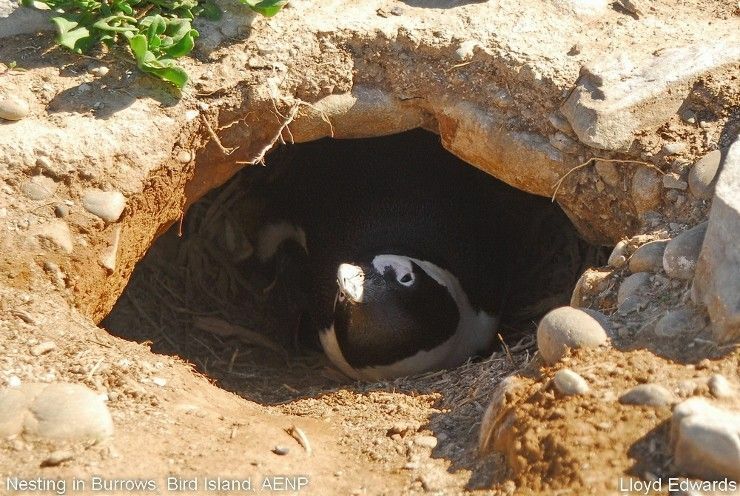 Research by Dr Lorien Pichegru pointed to a lower hatching success of eggs in artificial burrows compared with open nests but showed a higher chick survival rate. 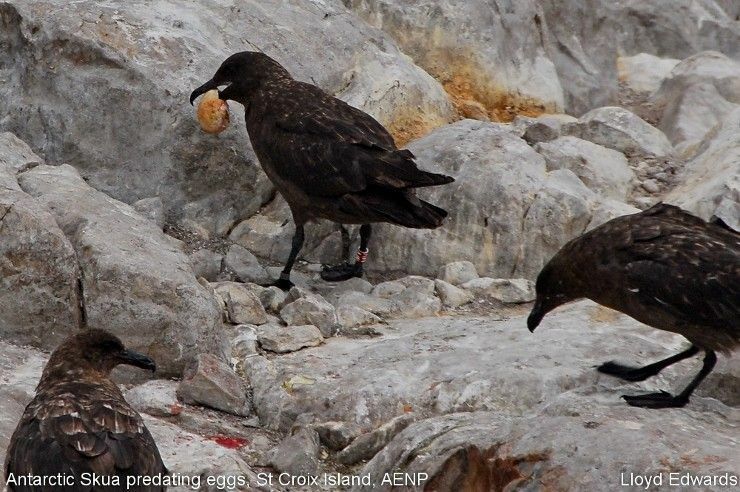 If their design was improved, they could offer long-term protection against climate change and predation, particularly for chicks.